You have read this article downloads / paper / printable with the title July 2009. You can bookmark this page URL http://jenkrebs.blogspot.com/2009/07/printable-bookmarks.html. Thanks! You have read this article downloads / paper / printable with the title July 2009. 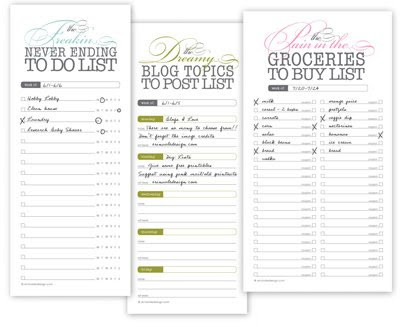 You can bookmark this page URL http://jenkrebs.blogspot.com/2009/07/printable-lists.html. Thanks! You have read this article time-wasters with the title July 2009. You can bookmark this page URL http://jenkrebs.blogspot.com/2009/07/awesome-optical-illusions.html. Thanks! You have read this article time-wasters with the title July 2009. You can bookmark this page URL http://jenkrebs.blogspot.com/2009/07/any-twitter-stories.html. Thanks! 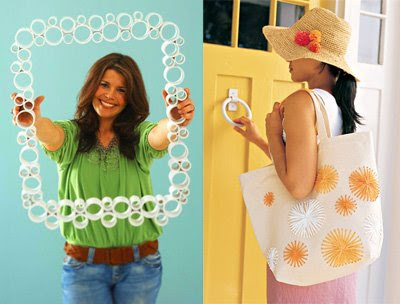 You have read this article decorating / favorite things / home with the title July 2009. 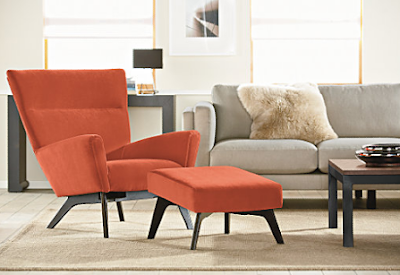 You can bookmark this page URL http://jenkrebs.blogspot.com/2009/07/i-want-tangerine-chair.html. Thanks! You have read this article downloads / paper / printable with the title July 2009. You can bookmark this page URL http://jenkrebs.blogspot.com/2009/07/papercraft-creatures.html. Thanks! You have read this article felt / sewing / tutorials with the title July 2009. You can bookmark this page URL http://jenkrebs.blogspot.com/2009/07/small-cute-thing.html. Thanks! For free fonts that don't make you cringe, check out Font Squirrel. Their goal is to be the best resource for high-quality, commercial-use, free fonts. I'm imagining some guy over there sitting in front of his computer sifting through submissions to find the ones that make the cut. "Barf." "Eeew." "Nasty." "Respectable!" "Barf." If you've seen something lovely somewhere, submit it for the good of humanity. You have read this article downloads / fonts / graphic design / resources with the title July 2009. You can bookmark this page URL http://jenkrebs.blogspot.com/2009/07/decent-looking-free-fonts.html. Thanks! Has anyone tried out Fabric on Demand yet? I'm curious. It's a digital textile printing company catering to "do-it-yourselfers." Upload your design and choose from 8 different fabrics to print on. They'll email you a proof, and once you approve it, you'll get your order in a week. I was pretty underwhelmed when I tested Spoonflower a year ago, but maybe I'll give this one a try someday. You have read this article fabric / resources with the title July 2009. 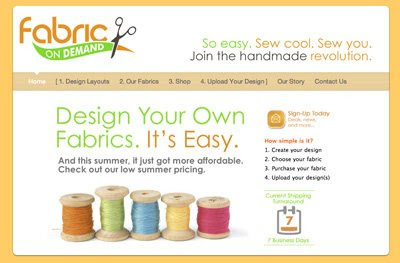 You can bookmark this page URL http://jenkrebs.blogspot.com/2009/07/fabric-on-demand.html. Thanks! 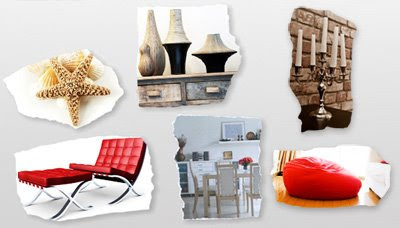 The International School of Color and Design offers this quiz to help you find your interior decorating style. Good luck... mine was way off, but hey, it was fun. You have read this article decorating / quizzes / time-wasters with the title July 2009. 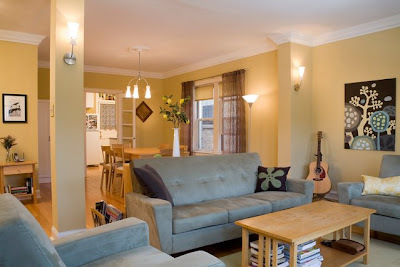 You can bookmark this page URL http://jenkrebs.blogspot.com/2009/07/quiz-what-your-interior-style.html. Thanks! You have read this article downloads / invitations / printable with the title July 2009. You can bookmark this page URL http://jenkrebs.blogspot.com/2009/07/fill-in-blank-printable-invitation.html. Thanks! 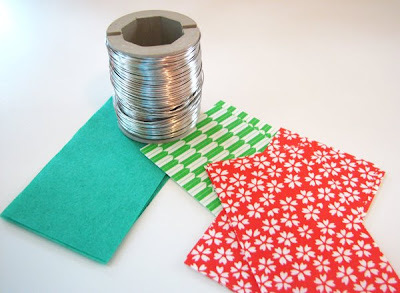 You have read this article decorating / entertaining / paper / tutorials with the title July 2009. 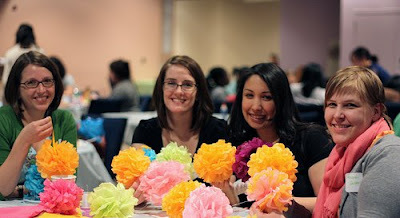 You can bookmark this page URL http://jenkrebs.blogspot.com/2009/07/pretty-summer-projects.html. Thanks! You have read this article events with the title July 2009. You can bookmark this page URL http://jenkrebs.blogspot.com/2009/07/another-craft-social.html. Thanks! 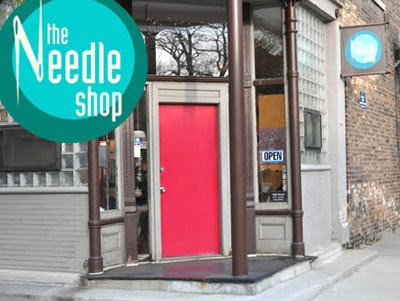 I finally visited The Needle Shop, here in Chicago. And fell in love! It's three walls of floor-to-ceiling fabrics in all those prints you drool over on the internet, but can't find in person. Amy Butler, Joel Dewberry, Kokka! Where was this store when I first started sewing a few years ago? You'll love it, I promise. There's stuff for screenprinting, lots of modern sewing patterns for clothes you'd actually wear and bags you'd actually carry, and plenty of sewn samples to admire. 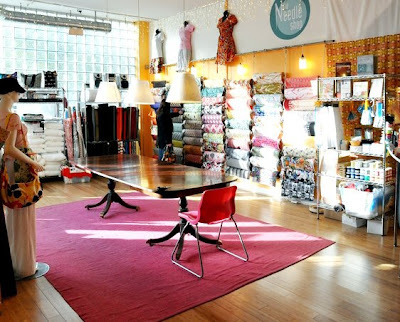 The Needle Shop offers classes, too: learn to upholster, make clothing and totes, screen print, you name it. Say hi to Rachel Epperson, the super nice owner, while you're there. And if you live outside of Chicago, visit the online shop. Every fabric in the store is available on the web. You have read this article shop with the title July 2009. 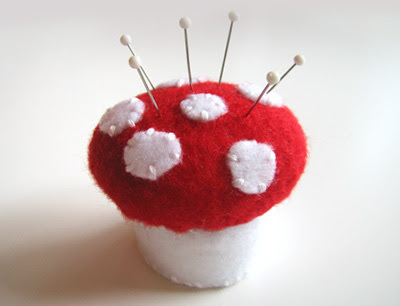 You can bookmark this page URL http://jenkrebs.blogspot.com/2009/07/the-needle-shop.html. Thanks! 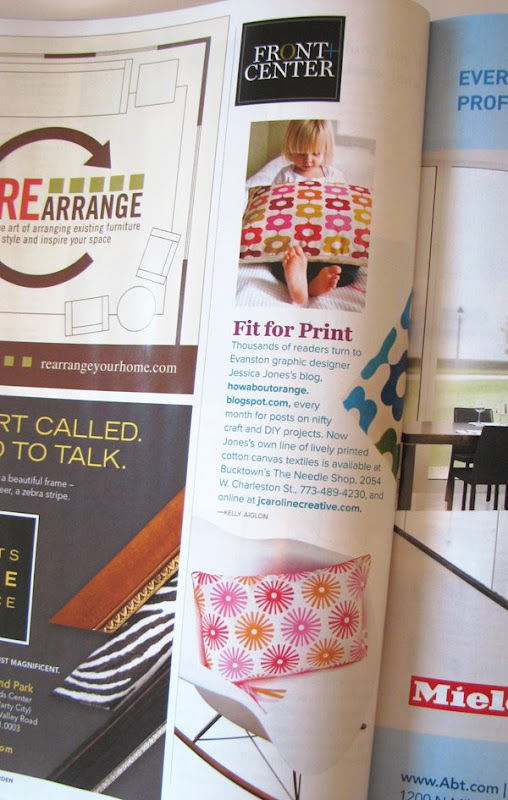 This blog and my fabric received a mention in the July/August issue of Chicago Home and Garden magazine. And speaking of my fabric, I was delighted to see this chair in the Amusement Park Flickr pool. Fun! You have read this article press with the title July 2009. You can bookmark this page URL http://jenkrebs.blogspot.com/2009/07/a-little-press.html. Thanks! You have read this article quizzes / time-wasters with the title July 2009. You can bookmark this page URL http://jenkrebs.blogspot.com/2009/07/quiz-guess-movie.html. Thanks! 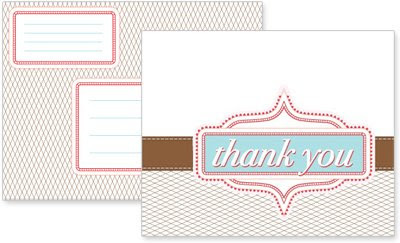 Cameron Blazer offers you a free printable thank you card and envelope. Or download these boldly patterned flat cards, customize your message, and print away. Hmm, now I just need to engineer some kind of color printer giveaway on this blog; wouldn't that be something? You have read this article cards / downloads / printable with the title July 2009. You can bookmark this page URL http://jenkrebs.blogspot.com/2009/07/printable-cards.html. Thanks! Poking around in the Furniture Redo Flickr pool made me want to drop everything and run to the nearest Goodwill. 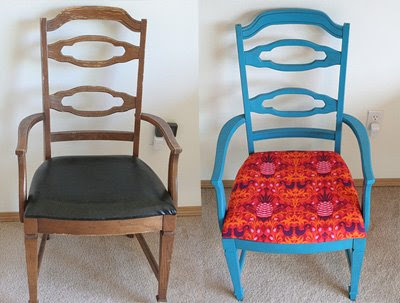 Folks have uploaded photos of furniture they've rescued and revived, and it's guaranteed to inspire you to paint something. I especially enjoyed this, this, this, this, and of course, this. Images above by All Things Artsy. You have read this article decorating with the title July 2009. You can bookmark this page URL http://jenkrebs.blogspot.com/2009/07/let-all-redo-some-furniture.html. Thanks! Yesterday Fed Ex delivered to my doorstep these porcelain vases. Love 'em. Modern and cool, and dishwasher safe! The design is Brown Links by notNeutral. 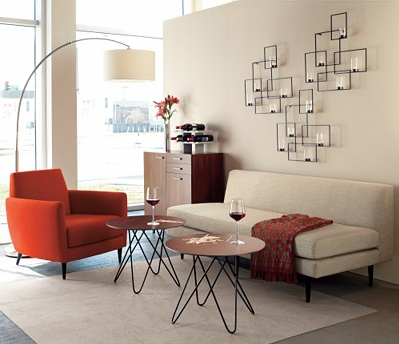 And good news for you: two lucky readers can win their own vase set, compliments of Accent Furniture Direct! Just leave a comment here before Friday (7/10/09) at midnight CDT with a way of contacting you, and two random winners will be drawn. Winners will be announced on Saturday in this post and emailed. UPDATE: Giveaway is now closed. The lucky random winners were commenters #530, Katie, and #538, Desi of Forth. Congrats! 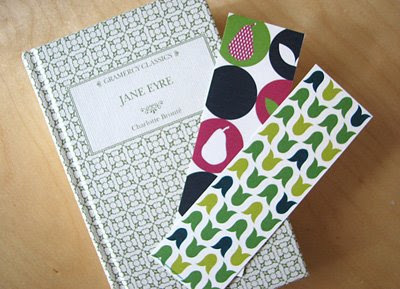 You have read this article favorite things / giveaway with the title July 2009. 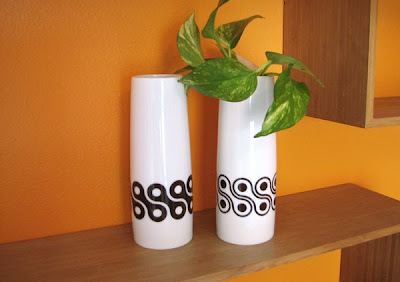 You can bookmark this page URL http://jenkrebs.blogspot.com/2009/07/brown-links-vase-set-giveaway.html. Thanks! 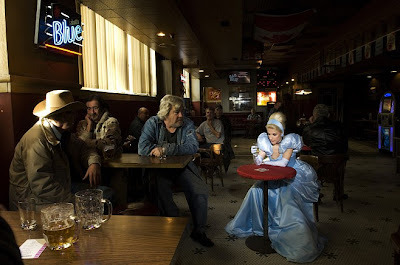 In the Fallen Princesses project, photographer Dina Goldstein explores alternate outcomes for Disney's princesses. What if "happily ever after" didn't pan out? JPG Magazine publishes more of her thoughts and a preview of the series here. Poor Rapunzel. You have read this article art with the title July 2009. You can bookmark this page URL http://jenkrebs.blogspot.com/2009/07/fallen-princesses-series.html. Thanks! Happy Independence Day weekend, people of the United States. I leave you with this idea for petite watermelons made from jello and limes, by Chocolate on My Cranium. You can make some for your picnic tomorrow. Have a good weekend! You have read this article entertaining / recipes with the title July 2009. 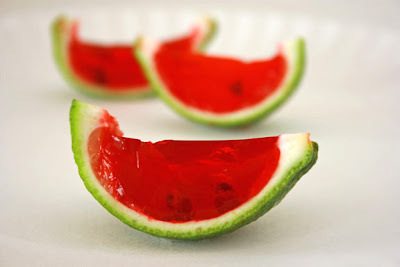 You can bookmark this page URL http://jenkrebs.blogspot.com/2009/07/mini-jello-watermelon-slices.html. Thanks! 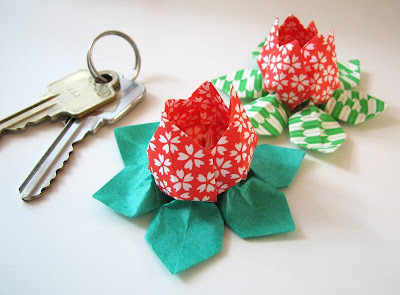 You have read this article origami / paper / tutorials with the title July 2009. You can bookmark this page URL http://jenkrebs.blogspot.com/2009/07/origami-lotus.html. Thanks!